The success of organ, tissue and eye donation hinges on the relationships with our hospital partners. Together, we are committed to supporting donor families and patients awaiting a life-saving transplant. You play such a crucial role in making donation possible and impacting the lives of others. Dr. Bennett deBoisblanc talks to us about the Gift of Life and how a casual encounter inspired him. Want to learn more about donation and transplantation? Listen to The Gifted Life Podcast! A new episode releases every other Friday and each episode is about 30 minutes long. 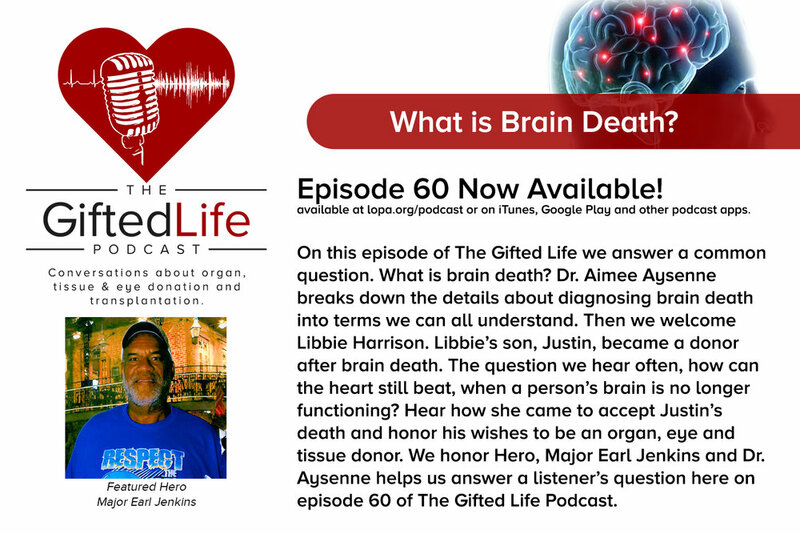 Look for the 'PODCAST' link at the top of this page to find us on your favorite podcast app and subscribe, or click the image to listen to episode 60, focusing on brain death, right now. An explanation of brain death by Dr. Aimee Aysenne. An explanation of brain death given in Spanish by Dr. Juan Duchesne. Watch this video for another great explanation about brain death.